New fresh look. Same exquisite quality. New fresh look. Same exquisite quality. A New Year brings a lot of new goals to accomplish with it. We at Deutsch Houston want to ensure we continue to provide quality customer service and top of the line products to our customers while growing our business. This year, we want to celebrate a great close out of 2018, our rebranding, and continued investment in the Houston community. Our goal is to make a lasting impact within our community and their loved ones. We hope you continue to trust us as your local jeweler in 2019, and for many more years to come. Established in 1983, Norman Silverman Diamonds has made its mark by offering a prestigious selection of large and rare white diamonds, as well as impressive fancy yellows, pinks and blues. Starting as an apprentice cutter, owner Norman Silverman discovered his inner passion for the finest gems. He visualizes each stone as a one-of-a-kind finished piece of jewelry, and thus our company prides itself on its uncanny ability to design remarkable treasures completely inspired by our diamonds. 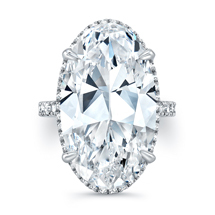 Norman Silverman Diamonds is synonymous with the finest diamonds in the world. Known for maintaining values and integrity while catering to the jewelry wearer’s desires. From elegant engagement rings to fashion-forward and timeless jewelry. Norman Silverman diamonds are distinctive and please even the most discerning eye. How many years have you worked for Deutsch & Deutsch Houston? What is your favorite precious metal? What is your favorite watch make and model? My favorite watch make and model is the Rolex Oystersteel GMT Master II with Blue and Black Bezel. What is your favorite customer memory? In the last 24 years, there have been many favorite memories. From my customer who had me provide champagne and roses, so he could propose in the store, to the couple who met during Hurricane Harvey, had a flash dance proposal in New York and the customer who walked in a few days before Christmas and spent a quarter of a million in jewelry for his wife. My friends always tell me I should write a book about my experiences, but no one would ever believe it. I’m just happy I get to work in a happy environment that makes people happy. This has been an opportunity to make life-long friends. Ben and Stephanie were both college athletes at Texas A&M University, where Stephanie was a soccer star and Ben was a football player. Ben had noticed Stephanie at campus events and asked her out for their first date, which ended up lasting for nearly four hours and included both lunch and dinner! They dated for 3.5 years and Ben knew it was time to ask Stephanie for forever. Ben’s mother, a longtime Deutsch customer, brought Ben in to work with Linda Turboff to select the ring of the couple’s dreams. 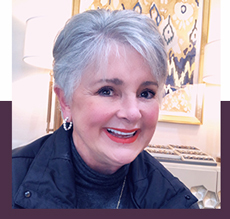 With Linda’s expert guidance, they landed on a beautiful cushion cut ring that sparkles in every light. Ben proposed on December 15, which already was a special date, as it is Ben’s birthday and the day that Stephanie was graduating with her master’s from Texas A&M. To celebrate these events, both families traveled from all over the country to be in College Station. 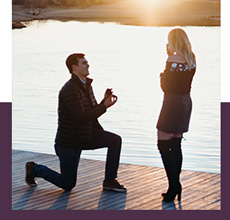 After a proposal on a dock under a beautiful sunset, the newly engaged couple joined friends and family to celebrate the wonderful news. They plan to wed in summer 2020 and look forward to decades of happiness to come!